What can possibly go wrong with power supplies? How do you check that it's working? To review the power requirements and wiring go here. To avoid damaging the sensitive semiconductors, you'll want to check these things. Are you sure you have a DC supply? The "wall wart" style of power packs come in both AC and DC flavors. Read its engraved specifications carefully. 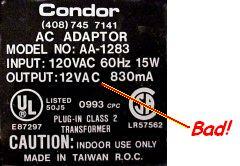 If it says "12vac 800mA" then it is an AC supply. 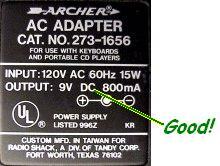 It must say DC as in "12vdc 800mA" or it will fry all the LEDs and op-amps. If it has no engraved specifications, you can test it with your voltmeter. Connect the probes and set your voltmeter for a 20-volt AC scale. Turn on the power pack. If the meter moves from zero, then you have an AC power pack and must not use it. Does it have adequate voltage and current? 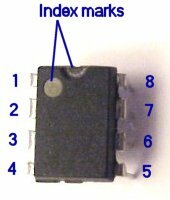 The 741 op-amp will run on a range of voltages from +/- 12 to +/- 17 volts DC. Please note that a power pack rated for 15vdc will normally provide a little more voltage, perhaps around 17v. This will drop a volt or two as the current demand increases. Anything from 17v below will work fine, the precise value is not critical to the trusty old 741 op-amp. Do you have the proper polarity? Use your voltmeter to verify the positive and negative wires from the power pack. Set the voltmeter to a 20v DC scale; when the meter indicates positive voltage the red probe is connected to the positive wire. Does it matter if you use a 110vac to 12vdc adapter, 1000mA instead of a 800mA adapter? It really doesn't matter what current rating is on the 12vdc adapter, as long as it's at least 800mA. A higher rated adapter may run cooler and last longer than a barely-capable one. Do you have adequate ground connections everywhere? There are many ways of wiring connections to ground, but I recommend using 'star' wiring instead of 'daisy chain' wiring. It just works better. Try to avoid a lot of point-to-point-to-point ground wires through the circuit board. These are equivalent to tiny series resistors, but it works better if they are more like little parallel resistors to ground. Are you ready for the first power applied? You should temporarily remove all the op-amps before applying power the first time. This allows you to measure the power rails before plugging in the little smoke generators. Temporarily unplug and remove the 741 op-amps. Plug in the power and turn it on. Here's what to look for in the smoke test. Do the pilot lights turn on? If the power is reversed, then the LEDs will remain dark. Also, if the LEDs are connected backwards they will not light up. These LEDs are a convenient visual indicator that your power supplies are turned on and working. You can blow them up with too much current (i.e. a dead short across the power supply) but not by plugging them in backwards. Are the pilot lights bright enough? This is merely a subjective matter. If they're too dim, reduce the value of the series resistor by 10 - 20%. If too bright, increase the resistor's value. Does the circuit bring power to the proper pins? Use your voltmeter to measure the positive and negative power connection to the op-amps, before they are plugged in. Pin 7 on all the 741s should be +15vdc. 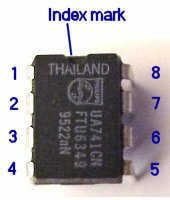 Pin 4 should all be -15vdc. Now you can plug in the op-amp chips. Pay attention to orientation! If it is plugged in backwards then it will puff its little heart out into smoke. There are two ways to identify the pins. There may be a circle stamped next to pin 1 as shown at left. Or there may be a U-shaped mark at the top of case, as shown at right. Sometimes there are both.